Meet the celebrity “Potty Training Whisperer,” Jen Singer. 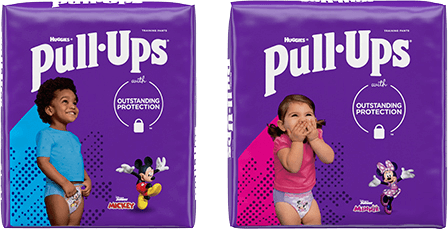 She has been working with Pull-Ups® for years and can give anyone the scoop on potty training. Here she tells her story about giving potty training advice to celebrity mom Melissa Joan Hart. Melissa’s 27-month-old son, Mason, was already showing some signs of readiness, including sitting on the potty and staying dry through naps. He was even waking up dry in the morning! But Melissa just had a second baby, and she didn’t want to start seriously potty training during such a major change in Mason’s life. Smart move. I also recommend that parents put off potty training during such life events, including moving, a new caretaker or a change in the family. Potty training can be one of the most labor intensive of your toddler’s milestones, but like Melissa, if you stick to a plan — and plan to adjust as needed — you can have success, too. Mason was already getting a chocolate treat for sitting on the potty, but his success rate had been limited. I suggested that Melissa change the treat to signal the start of the potty training process in earnest, so she bought some small toy cars like the ones my boys used to line up in their rooms. I also recommended big hugs, high fives, or a celebratory song and dance, because toddlers won’t find endless amusement in seeing their parents do their own potty success dance. Like any toddler who becomes a big brother or sister, Mason was craving attention. So we decided that Melissa and her husband should set aside time to make a big deal out of Mason’s potty training efforts. They’d make sure to put Mason on the potty every hour or so, all the while making it fun by using books and videos as incentives and the toy cars as rewards. So far, Mason has had great success, but the cars no longer continued to motivate him as much as they used to. Melissa began incorporating gummy bears into the rewarding mix, and his enthusiasm continues to grow. Still, I’ve let her know that setbacks happen (like Mason’s loss of love over the cars). Potty training can be one of the most labor intensive of your toddler’s milestones, but like Melissa, if you stick to a plan — and plan to adjust as needed — you can have success, too. And that will make you and your toddler feel like stars.